Last year saw a drastic increase of refugees arriving across Europe. Due to necessity of accommodating and providing support to newcomers, many resources and people are needed. This also requires new ways of working with these problems. This challenge did not pass Bremen, which received 4.888 Asylum applications in 2015 (Asylgeschäftsstatistik, 2015). 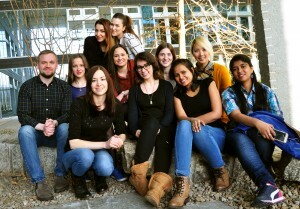 In a 6 months project, students of the master program in Digital Media explore a new perspective on the challenge of supporting integration of refugee and migrant young people into a local environment. 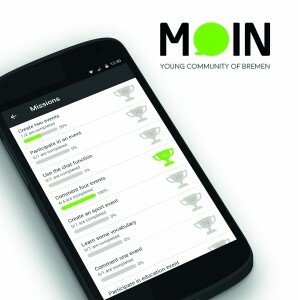 The project focuses on the development of a mobile application that helps migrant and refugee teenagers in Bremen easily get in touch with local society, get introduced to new culture and make friends. According to statistics of 2014, there were about 15 refugee camps in Bremen and about 2.233 people arrived to the region. By the end of 2015, the number of camps had doubled and the amount of arrivals almost quadrupled (Schlee, 2015). Among them are 495 teenagers without parents. These numbers make Bremen the German city with the 8th highest amount of refugees (Fischer, 2015). To find out the most significant questions and possible ways to overcome some complexities, a group of students from the Digital Media department conducted research that included a literature review, a study on existing projects in the same field, and personal interviews in refugee camps and in schools of Bremen. The interviews with migrant teenagers between 13 and 20 years of age revealed many concerns. For instance, refugee teenagers have big amounts of free time and few activities to spend it on. They spend a lot of time in refugee camps isolated from local society and have little chance for adaptation. Most of them wish to communicate with local people and to have regular social lives, but such possibilities for them are limited. Many teenagers do not have a chance to get in touch with local people despite their interest in doing so. On the other hand, teenagers that have a social life through their attendance to educational institutions and sports activities feel much better in this aspect. I am firmly convinced that interviewing young refugees was a unique and extraordinary experience for all of us. Another issue is that the language barrier limits their communication with local people and as a result leads to a poor social life. Teenagers find it hard to get to know people and to make friends within local communities without speaking their language. This language barrier also creates difficulties with accessing most of the civil services such as medicine, governmental and official services, using city facilities like public transport, and generally participating in social life. Possibilities of learning German for newcomers are limited by the amount of German language courses provided by the government and available digital tools, even though most of the refugees could learn the language in its natural environment through communication with native speakers. I think everyone should get in touch with refugees to know (even if it is just a little bit) what happened to them and what happens to the world while we live our normal lives. On one hand, a lack of relatives and acquaintances makes the process of adaptation to the region harder and more stressful. On the other hand, young people that have no relatives are more open for communication with new people and establishing friendships. The interviews also showed the following difficulties that are faced by new arrivals: familiarization with a new place, understanding local regulations, rules and procedures and having less information about future opportunities. Another challenge here is the cultural background of the newcomers. Most of the newcomers in 2015 originate from Syria and the Arabic Republics (162.510 people), Albania (54.762 people), Kosovo (37.095 people), Afghanistan (31.902 people), Iraq (31.379) and in smaller numbers from Serbia, Eritrea, Macedonia, Pakistan and unknown countries (Asylgeschäftsstatistik, 2015). This leads to the assumption that the newcomers culture differs greatly from the local one. Such differences can be seen in regular daily life habits for food, dressing up and different core values on relationship, friendship, entertainment and religion. This creates a challenge to help people learn about local culture and cultural norms in German society. The project group was asked to suggest a way of assistance in one of the problems using digital technology, education, and gamification. As an approach for reaching the project goals various types of research methods were chosen. Analytical methods included literature analysis, assessment of the current state of the problem from statistical data, reviewing various types of approaches to cultural communication, and analyzing the state of the art and existing projects related to the current topic. Qualitative interviews and prototype testing were used to support the analysis empirically. These findings provided a basis for further projects development, shaping of concept ideas and further testing of project prototype to measure effectiveness of the product. The introduction already revealed the interdisciplinary character of the situation. It combines areas of communication theory, psychology, education, studies of migration processes, digital media area and gamification issues. From the side of communication theory: according to the theory of Young Yun Kim, all human are born in a specific cultural environment and during growing becomes a part of this culture. This process is called enculturation (Kim, 2001). When individuals enter a new culture, various onflicts with social norms and rules can arise. The process of adapting these is called acculturation. Communication, as a process that happens using verbal and non-verbal codes, helps individuals with developing relationships with people (Liu, Gallois, 2014). In the case of migration situation in Germany, from the interviews we made in the refugee camps, the two main problems that prevent uneasy integration of newcomers are language barriers and a lack of contacts to local people. From the side of educational theory many educators and psychologists look at education as at social institution. For instance, in schooling years children develop communication and social skills (Meyer, 1977). Going back to conducted interviews in camps and schools with migrant teenagers those of them who attend schools feel more comfortable and integrated to a local culture than teenagers from camps. When taking a look into contextual education approach, one can see that the learning process happens not only within the learner itself but it occurs in the community as a shared process (Siddiquee & Kagan, 2006). This is supported by the Social Development Theory of Lev Vygotsky. He stated the term Zone of proximal development which describes a social environment of individual that has a potential for his or her development. By this theory, a person can achieve more goals with the help of others and achieve higher levels of thinking and understanding. The theory also states that „learning is a necessary and universal aspect of the process of developing culturally organized, specifically human psychological function“ (Vygotsky, 1978). These ideas also correspond with modern theory of informal and self-learning which occurs in different places outside of official schools (like home, daily life, human interactions, work, various activities and others) and usually happens accidentally, spontaneously and not intentionally planned. What is more, it does not require experienced teachers or a special curriculum. Therefore, the potential of self-learning for cultural rules and norms are part of the research field of this project research as well. From the side of Digital Media: the modern migrant situation has a technological character. Most of newcomers use various digital devices, especially mobile phones (Maitland, 2015). Mobile applications, social media, navigation tools, online translators and others have created new infrastructure for people. To take a positive look at such an expansion of technology and resources, it provides an opportunity for refugees to learn more about local culture, get familiar with their new living environment, learn languages, and get other informational support. Here we also refer to a widely researched theory of motivation that addresses both intrinsic and extrinsic motives for acting, and the relation of motivation to growth and well-being (Deci, Ryan, R. M, 1985; 2000). Intrinsic motivation can be found in group interviews in refugee camps and in schools that migrant teenagers are willing to learn German language and understand their new home. Meanwhile, the extrinsic motivation can be enhanced by achievement from their learning experience. More specifically in this case, with the availability of mobile phones among migrant teenagers, they can use their phone anytime and anywhere, including its usage for self-learning purposes. From the side of gamification: Gamification is one of popular way to make learner become more dedicated and concentrated on their learning progress (Dicheva et al., 2015). Gamification is defined as using game-design elements in non-gaming contexts (Deterding, 2011). Based on the idea that players of all types seek to satisfy psychological needs in the context of play, the “pull” effect motivates the player for further play (Ryan, 2006). Therefore, in the context of the use of gamification elements, one can not only enhance the learning experience but also allow the users to put themselves in the learning environment. Requirements elicited through interviews and the analysis of current research and projects created a basis for the development of a concept for a mobile application. The first thing that became clear after the conducted research is that a local language is a key to any culture. Without knowing a language, people have difficulties to manage their fundamental needs. The faster newcomers learn the language, the easier they find a way to get integrated into a new place. But language is not just another science or educational subject – it is natural and alive and learned more successfully in the context (Gu, 2003). Communication with local people is key to learning a language in context– more possibilities for informal and interesting communicational activities create a better basis for language learning, and getting to know local culture, environment and norms. Communication in a context of common interests creates a comfortable environment for that. Moreover, migrants have to adjust to a new culture and lifestyle. For instance, Western cultures have more independent way of life of individuals than Middle East societies. Private zone, ways of communicating, personal distance and other concepts needed to be learned and understood by newcomers. The students in the project suggest a technological approach to help this problem be solved in a natural way – a platform that helps refugees and migrant teenagers meet with local people. 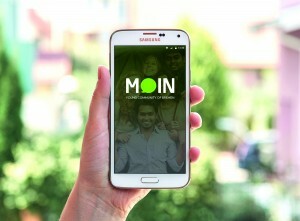 The project slogan for this project is “Moin! Young community of Bremen”, as a goal to provide young people from Bremen with various cultural backgrounds with the possibility to get in touch with people with similar interests like hobbies, sport activities, intellectual games, cultural events, city excursions and others. 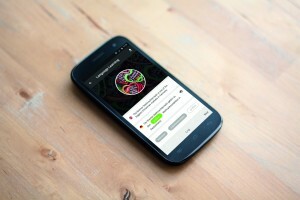 As a result, the project represents a mobile application which is targeted at all young people in the city, no matter which culture they are from – every person can gain useful experience from communicating with other cultures. Furthermore, it is a way to learn other languages, train soft skills, and obtain a higher level of cultural intelligence starting at a young age. The project research has been conducted by literature, interview with migrants and experts, state of the art analysis. It became only a step for the technological sight on the migration issue. The integration process of migrants takes time but it basically depends on how easily people are able to adapt with new society and how much they are communicating with local community. While many organizations and media sources consider the issue as problematic we suggest making a positive look at the challenge and finding to its distinct potential. A study from the Office of the United Nations High Commissioner for Refugees (UNHCR) investigated over 86 percent of young refugees own a mobile handset, and more than 50 percent are using the internet either once or multiple times per day (Maitland, 2015). With such available resources it creates an opportunity to develop a mobile application which could help migrants to get into contact with local people and help them adapt to Germany. 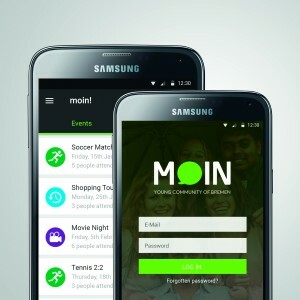 The “Moin” application explores the possibility of gamified digital communication that support informal learning to new things in a new culture, and focuses on how such communication can lead to integration. Furthermore, intercultural exchange of young people provides future potential for new ideas and forms a basis for creative and innovative thinking which is highly demanded nowadays in Europe. It not only stimulates cultural intelligence in the society which leads to better understanding and natural way for young generations to learn living and working in intercultural social groups. It also stimulates language learning in a natural, indirect and more convenient way. Here we talk not only about learning German language by newcomers but also about practicing other languages by people from Bremen. As an expected outcome, it creates a society of tolerant citizens who used to accept different values and overcome intercultural challenges since young ages. Currently, the group is looking for a further support of the product in Bremen, people or organisations who are interested in further development of the product for the region after the end of the University project term. Hong Yin Ngan ist studying Master of Arts in Digital Media at the University of the Arts Bremen. Anna Lifanova is studying Master of Science in Digital Media at the University of Bremen. Sabrina Rahman is studying Master of Science in Digital Media at the University of Bremen. Alexandra Okunewitsch is studying Master of Science in Digital Media at the University of Bremen. Asylgeschäftsstatistik für den Monat Dezember 2015: Bundesamt für Migration und Flüchtlinge (2015), pp.5. Dicheva, D., Dichev, C., Agre, G., & Angelova, G. (2015). Gamification in education: a systematic mapping study. Educational Technology & Society, 18(3), 1-14. Gu, P. Y. (2003). Vocabulary learning in a second language: Person, task, context and strategies. TESL-EJ, 7(2),1-25. Kim, Y. Y. (2000). Becoming intercultural: An integrative theory of communication and cross-cultural adaptation. Sage Publications. Meyer, J. W. (1977). The effects of education as an institution. American journal of Sociology, pp.55-77. Rheinberg, F., Vollmeyer, R., Rollett, W. (2000). Motivation and Action in Self-Regulated Learning. Pp. 503-529 in M. Boekaerts, P. Pintrich & M. Zeidner (Eds.) Handbook of Self-Regulation. New York: Academic Press. Ryan, R.M., Rigby, C. S., Przybylski, A. K. (2006). The Motivational Pull of Video Games: A Self-Determination Theory Approach. Motivation and Emotion, Volume 30(4), pp 344–360. boi 10.1007/s11031-006-9051-8. Siddiquee, A., & Kagan, C. (2006). The internet, empowerment, and identity: an exploration of participation by refugee women in a Community Internet Project (CIP) in the United Kingdom (UK). Journal of Community & Applied Social Psychology, 16(3), 189-206. Vygotsky, L. S. (1978). Mind in society: The development of higher psychological processes. Place: Cambridge, MA: Harvard University Press, pp. 90. Dieser Eintrag wurde veröffentlicht in Heterogenität und verschlagwortet mit App, App-Entwicklung, Geflüchtetenhilfe, studentische Forschung, studentisches Projekt von Hauke Schmidt. Permanenter Link zum Eintrag.